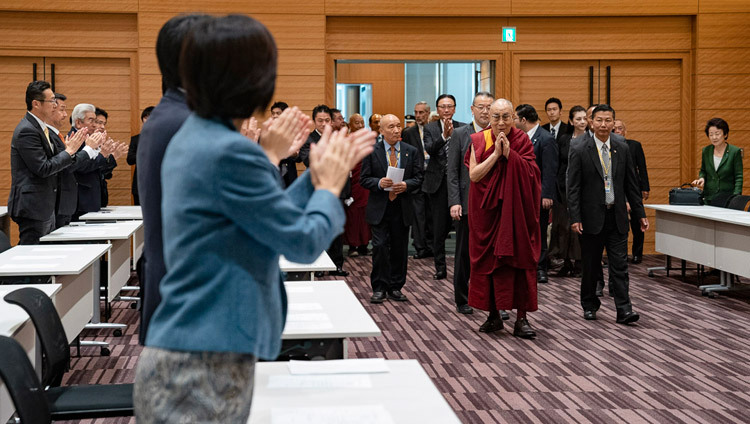 (TibetanReview.net, Nov22, 2018) – The Dalai Lama was on Nov 20 welcomed to Japan’s parliament, the Diet, by the All Party Japanese Parliamentary Group for Tibet (APJPGT) in the course of his 10-day tour of the country which began on Nov 12. He has spoken to the group members about the historical relations independent Tibet had with Japan dating back from the rule of the 13th Dalai Lama (1879-1933) which, however, lapsed after the Second World War. Nevertheless, he has continued, Japan, an important Asian nation, remained a country with which the Tibetan people continued to have strong religious connections. The APJPGT members have apprised the Dalai Lama about their plans, discussions they had held, and a resolution they have adopted on the issue of Tibet. They have spoken about their keenness to contribute to the preservation of Tibetan culture, language and religious traditions, given the fact that they were part of the Tibetan identity and were being suppressed by China. They have also expressed interest to support economic and educational development in Tibet. And they have spoken about the appeals they had launched for the release by China of Tibetan prisoners of conscience. APJPGT Chairperson Hakubun Shimomura, a Member of the House of Representatives from the ruling Liberal Democratic Party, has spoken of his group’s admiration for the Dalai Lama and his leadership. He has said APJPGT also worked closely with NGOs who supported the cause of Tibet. Vice-Chairperson Shu Watanabe, from the People’s Democratic Party, while welcoming the Dalai Lama for his fourth visit to the Japanese parliament at the group‘s invitations, has expressed admiration for the Tibetan leader’s emphasis on the welfare of all the seven billion human beings alive today with his stress on the need for greater compassion. The group‘s General Secretary Nobuyuki Baba, who belongs to the Japan Innovation Party, has spoken as most important the need to share with others the cause of Tibet in today’s digital world where people have access to so much information. Kyoko Nakayama, from the Party of Hope, has bemoaned the fact that the cause of Tibet has been neglected when the whole world should pay attention to it and complimented the Dalai Lama for his great achievement despite the hardships of his 60 years in exile. And Yoshiko Sakurai, Chairperson of the Japan Institute for National Fundamentals, has spoken of his visit to Dharamshala with fellow-MPs and his determination to work for the Tibetan cause. He has spoken of the APJPGT being the largest parliamentary group for Tibet anywhere in the world. He has said there was no intrinsic conflict between the Tibetan and Chinese peoples but that the Chinese leaders’ behaviour had created a rift between the two. He has said discrimination against Tibetans continued to exist in the administration, schools and even in prisons. He has pointed out that the Chinese government proclaims harmony and stability while their policies completely undermine these goals. The Dalai Lama had last visited the Diet building on Nov 16, 2016 when 229 MPs turned up to hear him.